Singapore's "Christmas in the Tropics" simply isn't complete without light-ups and displays along selected thoroughfares. 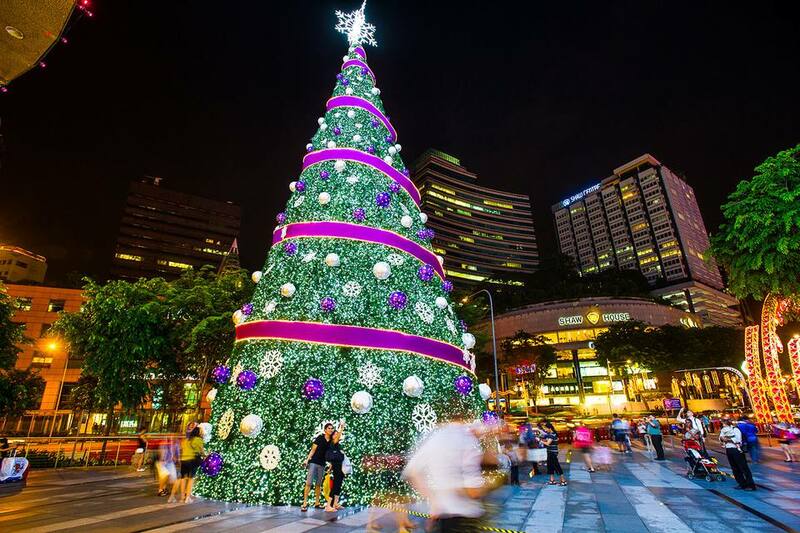 From November to the first week of the New Year, Orchard Road will be lit up with stunning electric light displays that illuminate Singapore's prime shopping district. "Christmas on A Great Street", the annual festive light-up on Orchard Road, illuminates Singapore's main shopping drag. The light-up proper spans 2.88km from Tanglin Mall to Plaza Singapura. Working with the theme “Disney Magical Moments”, the light-up works Disney and Pixar characters into the light-up's overhangs, sidewalks and Christmas trees, bathing the street in blue, turquoise and sapphire light. 2018's Orchard Light-Up lasts from November 10, 2018 to January 1, 2019. The whole shindig is a collaborative effort between ORBA, the Singapore Tourism Board, and their corporate partners Hitachi and MasterCard. The Orchard area is most accessible via MRT; disembark at the Orchard MRT Station (NS22). For hotels in the vicinity of the Orchard Light-Up, read this article: Hotels on or near Orchard Road, Singapore. The plaza in front of Ngee Ann City will be transformed into a Yuletide-themed village, with arts and crafts activities for the children and the presence of Santa Claus himself. From November 15 to December 26, the Great Christmas Village will feature a collection of holiday-oriented events and activities, including amusement ride, a two-level carousel, and a “Santa House” where kids can do Christmas craft activities for free. Santa will also visit the House for Meet and Greet sessions every Friday and Saturday from 7pm to 9pm. 25 food outlets serve international cuisine at the Village’s dining area, with brands including PAUL, Royal Selangor and Starbucks. The European-inspired decor really comes to life after dark, when twinkling lights transform the Village into a magical wonderland. On Christmas Eve itself, fireworks bring the village’s activities to a crescendo as everybody counts down to midnight and Christmas day. See Orchard's light-up from a unique vantage point - an open-top bus rolling up and down the street. Duck and HiPPO Tours offers a "HiPPO Christmas Light-up Tour" that explores the country's top Christmas light-ups. The tour operates between November 16 to December 28, with twice-nightly departures from the Duck & HIPPO Tourist Hub in Suntec City. Tour guests must meet at the Tourist Hub at least 15 minutes before departure time. The 45-minute tour takes visitors riding on an open-top HiPPO Bus down the Light-Up's length, beginning at Tanglin Road and winding up at Bras Basah before circling back to Suntec City. Visit the official site for more details. In Marina Bay, Singapore, the Gardens by the Bay's Supertrees serve as a towering backdrop for “Singapore’s largest annual Yuletide event”, with light sculptures called “luminaries” that recall European churches and Christmas ornaments (including a massive Christmas tree and a 7-storey-high mirror maze inspired by Alice in Wonderland). To entertain the little ones, a magic show performed by an America’s Got Talent finalist will take place at the Meadow; Rob Lake performs magic tricks exclusively created for the festival. The Festive Market accompanying the Luminaries serve up Michelin-star-level burgers and upmarket Singapore hawker food for all comers. Musical accompaniment will be provided by carolers at the Cassa Armorica near Santa’s Grove. Visit the Christmas Wonderland official site for admission tickets, priced at SGD4 per person; onsite tickets cost SGD 6. Come to the Gardens by the Bay before sunset to catch the light-up as it happens; the Wonderland runs from November 30 to January 1. Get Ready for Singapore's Most Colorful Parade - Chingay!